German Hallertau Blanc is a daughter of Cascade, bred specifically to fit the needs of American craft beer styles. It is mostly an aroma hop with moderate to strong notes of pineapple, white grape, fresh lemongrass stalk, and passionfruit characteristics. 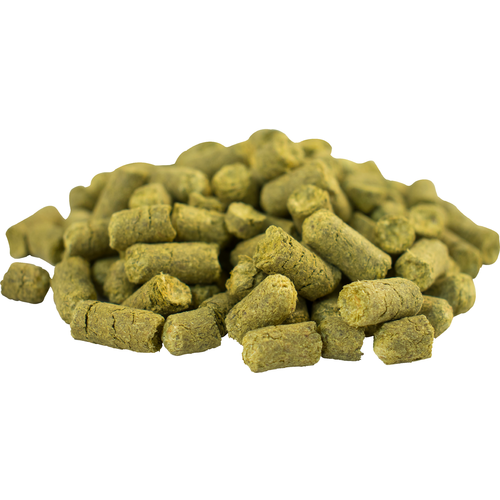 A great aroma hop to use with IPA's, Belgian ales, wheat beers, and Brett fermentations. Plan on using these hops in several upcoming beers. My friend doesn't enjoy "homebrew" beer so I made a Budweiser clone: 6lbs 2 row, 1lb flaked rice, 5 oz. carapils. .75 oz of this hop at 60 minutes and .75 oz at 3 minutes was added in the boil. Fermented with S-23 and will know the result in a few more weeks. A subtle, light white grape flavor which might complement a saison or a hefeweizen. The flavor may get smashed in a hoppy IPA, but that is yet to be determined. Tasted great in my cream ale.